Two days following my encounter with the towering no name upright, I was drawn to a Fresno Bee Classified ad, that listed an antique ”Counsel piano” for sale at “$1500 or best offer.” (First thing that popped into my head was Indian pow-wow- tribal “council?”) What on earth was a Counsel? I snatched up my Pierce Piano Atlas for “counsel.” Often regarded as the “Bible of the Piano Business,” this hefty 400 plus page volume referenced over 12,000 names of pianos with serial numbers, dates of manufacture, and a sprinkle of company history. The late Bob Pierce, a dapper gentleman, piano merchant, world traveler and collector of $30,000 in miniature pianos had compiled an Atlas of piano manufacturers in alphabetical order that became a tuner’s indispensable companion. The volume also included glittery photos of Pierce mingling with the rich and famous and posing beside his decorative instruments. One snapshot revealed a French Provincial spinet that Pierce had personally donated to Lucy and Desi Arnaz for their original TV pilot. It could be seen permanently on the set as the show became a fixture, entertaining television audiences for years! Robert Furst was another rising star in the universe of pianophiles. His Internet “Bluebook of Pianos” had more than a compendium of serial numbers. It had expanded into a huge database that included pianoforte history and folkore. One of its valuable links offered a wealth of information about vintage uprights and their grades. As I sought to acquire the brand name identity of Alice’s old player, this is precisely where I had begun my journey. Veteran tuner, York didn’t know anything about Furst’s Online “Bluebook” but he most definitely wouldn’t be caught dead without his yearly, up to date Pierce Piano Atlas. At 84 he was not about to become hooked on the Internet. A consummate collector of salvaged ivory tails, bridle straps, knuckles, hammer butts, and bottles of moth battling cloves, he’d been known to stockpile his Pierce paperbacks since 1965 (first copyright). I’d even seen him pluck one out of a tattered black bag, proclaiming proudly, that he’d never tossed one of these editions in the trash. The same applied to his age worn tuning diaries that dated to 1948, the year he had embarked upon his great adventure as country doc to pianos of all shapes and sizes. From living, breathing musical instruments, to firewood and scrap material, he’d seen just about everything and wasn’t about to exchange his lurid on the job experiences to become a passive Internet maven of pianos. York had racked up a record breaking 50,000 tuning related house calls during his illustrious career that included rodent and moth eradications. “Now I been all over the map tunin,’ repairin’ and moth proofin’ at least 700 pianas a’ year since 1948 so I dun came across every type that’s out there, but off the top a’ my head I can’t remember bumpin’ into any “Counsel” piana,” he had said, when I questioned him about this particular brand. I had a creeping feeling this newly listed “antique” oddity was going to be one of those tonal abominations that would send me scampering out the door, nauseated to the point of passing out. Pianos like these turned up all the time and their owners usually had a false sense of their value. I had encountered one such disaster during my piano finding travels to the quaint Tower District of Fresno. 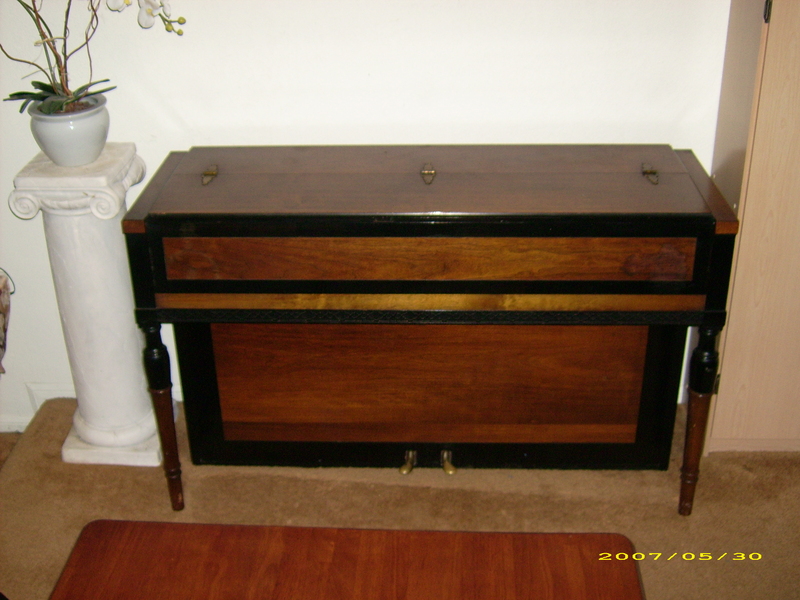 The piano on sale was a tall Chickering upright that was housed in a dark and dreary living room. With scrolled legs and an ornately filigreed rack, it looked like a nice piece of furniture, but with only 4 of its 88 keys sounding, the seller couldn’t justify her $4,000 asking price. (She had been convinced that the name “Chickering,” alone, would bring in the dollars) While the company enjoyed a sterling reputation in the annals of American piano building, its current, unplayable condition made its antique value die on the vine. In addition, it had very sharp ivory key edges that could easily draw blood from an eager player making it a further liability. Manufactured in 1885, according to its serial number, it might have been of interest to the Smithsonian or Great American Instrument collection in South Dakota. Otherwise it should probably be scrapped! I had encountered still another Chickering advertised for sale on the Internet that turned out to be more ornate than the vertical I had reviewed in the Tower. Dated to 1873, it was a “square model grand,” a predecessor of the more modern horizontal piano, and was housed in an upscale home in north Fresno. The morning I’d stumbled upon Camber Dupree’s Chickering listing, I remembered having seen a clone of it on a Smithsonian postcard sent to me by York. I had received it only weeks after we had met at the American Cancer Discovery thrift store. At the time he had offered to scour the inside of my Steinway M, 1917 grand with his old, reliable Filter Queen canister vacuum. He also wanted to sprinkle the key bed with clove powder to ward off moths but I decisively declined. Cedar chips placed in a bag on the cast iron plate were in my mind sufficient. And I definitely didn’t want to risk having my action clogged up with any powdery substances. It was no different when the late Bob Goolsby, piano tuner, wanted to dowse my action with talcum powder. and a sweet, clear, pleasant tone. “We just bought a Chickering concert grand of 1862, rather by accident! what work, if any, it might need to restore it to good playing order. here from Boston, we added the Chickering to our collection. “I wish my note to you about the Fresno housed Chickering could be as positive and uplifting as your last communication. But the 1874 antique square grand was a tonal disaster! Nothing about it worked, though it stood regal and awe-inspiring in a living room full of wannabe ‘antiques’. The only other item of interest was a brass tripod surveyor that dated to the construction of the Empire State building. Having tirelessly reviewed many loser “antique” instruments like the old Chickering square grand, I was not too optimistic about what I’d discover during a routine inspection of an “antique Counsel” piano as it was named in the Fresno Bee online classifieds. A preliminary telephone call to the seller produced the following information about it: The piano had no real name other than it was a “Counsel,” and the date of manufacture was a big question mark. This was par for the course, as most sellers listed their pianos with as little information as possible, mostly out of ignorance. They had no market-based grounding in piano parlance, even though so many of them claimed to be Ebay addicts who scoured the web for comparable pianos in order to set a believable asking price. But the “Counsel” identity quickly evaporated when I thought longer on it, and then it hit me like a ton of bricks! “I think you may have meant that your piano is a console,” I said with certainty to the seller. “Does your instrument stand about 40 or so inches from the ground?” I asked. He left the phone momentarily to measure it. Consoles were known to be bit larger than spinets. They stood 40 to 43 or so inches in height if measured from the base to the top. “Spinet” size pianos could measure anywhere from 36 to 39 inches and because of their diminutive size would probably have a smaller tonal projection because of their shorter strings and soundboard. Both consoles and spinets were considered to be “vertical pianos” and sometimes the terms were used interchangeably but not accurately. Sellers often confused their spinets with consoles or the reverse and never got it right, so buyers stumbled upon these pianos with an associated ignorance that they might have considered blissful. The seller, “Phil,” concurred that his piano was a “console,” because he thought it measured about 41 inches up from the ground. He answered, unenthusiastically. “Oh okay, I’ll just go and get a flashlight.” After some audible shuffling, he returned with a compelling reply. “It says A-E-O-L-I-A-N,” as he spelled out the individual letters, stumbling over a few.” I think that’s what I see,” he mumbled. It was fascinating information! The Aeolian Company was very reputable during the first part of the Twentieth century and had overseen the manufacture of world renowned pianos such as Mason Hamlin, Knabe, Chickering, and Weber. With its factory located in East Rochester, New York, it upheld very high standards of craftsmanship. It also owned a sterling reputation for making player pianos and pianolas, partnering with Steinway & Sons in the installation of a “duo art” player mechanism in some of its grand models. In later years Aeolian acquired more piano companies that were not as noteworthy as the originals, and manufactured what were called “stencil” pianos that had a decal name of one brand or another on their fall board, but were basically massed produced. Eventually the Aeolian company was taken over by a Steinway executive named Perez and its was factory moved to Tennessee in the 1970’s when quality production ceased. It wasn’t long before the company disappeared losing its former stellar reputation. A prospective piano buyer plagued by confusion in the morass of new and used pianos had to be made aware that reputable companies were often bought out by others without a guarantee of fine workmanship associated with the original. This was true when Young Chang, a Korean manufacturer bought out Weber and Knabe that were formerly under Aeolian. The name “AEOLIAN” intrigued me, and not having yet ascertained the serial number, I couldn’t get excited about it. “Why don’t you give me your address,” I said to the seller. “Are you’re gonna be home this morning?” I asked. The seller assured me that the family would be home all day “tidying up the place,” so he told me to come by anytime I wished. I took rapid notes, probably leaving out some important travel details, but figured it was so close by that I could pretty much wing it. I set out at about 11:00 a.m. expecting to arrive in about 10 minutes, but I ran into an unforgettable delay that will resonate for years to come. With all my rushing around, finding pianos, teaching, trying to complete my sixth CD, my mind wandered, and I did not have the presence of mind to fasten my seat belt. Maybe I was just lazy and didn’t think too seriously about it, which of course was no excuse for my wanton neglect of safety issues. In any case, I popped into my car, seat belt-less and headed toward the Fig Garden Village Shopping Center to pick up an instant camera to take photos of the Aeolian. Almost immediately I had become aware of a patrol car shadowing me into the parking lot. It was a Sunday morning, the day before Memorial Day, and there was hardly any traffic on the road, so there was no question that this singular vehicle was tailing me for at least a block. And when I heard a weird siren-like toot come out of it, I was panic stricken! What the heck had I done wrong? I knew that I’d followed the proper arrow down one of the lanes, though it was sometimes hard to see which way the arrow was pointing until it was too late. I tried to ignore the high-pitched blare emanating from the patrol car, but then something told me to turn my head around and see if this cop car was apprehending me and no one else! Oh my gosh, he was waving me over to a parking spot a few hundred feet away! I could feel my heart pounding! In no time the officer was leering into my untidy-looking car, telling me that I was being cited for not having secured my seat belt. I was sure he would add more charges against me for having a filthy car interior. There were papers, and Subway sandwich wrappers scattered everywhere! I couldn’t readily find my car registration that was buried somewhere in the glove compartment sandwiched among car insurance forms going back 5 or more years. Fortunately, the officer did not seem too concerned about the car registration because he had already acquired my driver’s license and other information. “Please get out of your car,” he said in an austere voice. I was feeling so nervous that I had parked my car in a crooked way, and when I opened the door to get out, it tapped ever so gently on the chrome of the neighboring car. I was mortified! What had I done now? This was definitely not my lucky day! “What are you talking about?” I said sheepishly as I feared I was guilty of more crimes–not just failing to fasten my seat belt. What an unlucky turn of events! “Well just take a look and see,” the younger woman replied. I bent down as instructed, and squinted my eyes, searching for the dent. But as hard as I looked I couldn’t find evidence of any damage to the vehicle. Meanwhile the officer sauntered over, in the midst of writing up my citation, and looked methodically at the whole situation offering a suggestion. I did as he said in the presence of the two apparently related women who kept backing each other up about what I had done to their car. The cop was watching intently as my door barely touched the horizontal chrome band that showed absolutely no marks on it. But way above the chrome to the upper left, near the car window, there was a scrape, and some peeling paint finish. It wasn’t remotely near the contact point of my car door. By this time the law enforcement officer brought home the truth loud and clear. The whole situation was incredible! This one woman was telling a sharp cookie law enforcer that his eyes had deceived him and that he had the memory of a rhinoceros! I was relieved that something was going right for me and that I had the backing of the officer. What little luck I encountered on this abysmal Sunday before Memorial Day had to be savored. I lingered until the officer completed his paperwork. He made sure to tell me that this wasn’t a “moving violation” so I shouldn’t worry about having my insurance rates jacked up or having to go to Traffic School. I briefly mentioned that what the ladies were trying to perpetrate was a Civil Code violation that amounted to “false reporting of a crime.” But he replied that until and when they filed charges against me, that a so-called “misdemeanor charge” could not be pursued against them. I breathed a sigh of relief that I had escaped punishment for something I had not done to the neighboring car and I thanked the patrol man for coming to my defense, but I also had an increased awareness that I should always affix my seat belt each and every time I entered my car. It was over 90 minutes since I had left my house to head out to see the Aeolian. To add insult to injury, I got lost on my way to the location, took a wrong turn and ended up in an unfamiliar neighborhood. I had almost given up in my attempt to see the piano, because it was growing hotter by the minute, with temperatures approaching 105 degrees. Without an operative air conditioning system, I was uncomfortably drenched in sweat. He completely understood my whole situation and told me head over to his place any time during the rest of the day. I took a much needed lunch break, showered and hopped into my car. But this time I took special care to harness my seat belt. With my camera and tape recorder stacked upon each other, I was ready for action. When I reached the house that was located in a very nice northwest alcove, I found myself inside its living room, staring at one of the oddest but most intriguing pianos I had ever seen. It looked like a fancy rectangular shaped antique table without a visible keyboard. It was sitting closed, but looking quite regal. In dark, polished walnut, with a trim of metal engraving, it was a beautiful sight to behold, and its legs were very ornate and attractive. The instrument sat beneath an awesome Renaissance painting that heightened the mood and effect. Totally drawn into the atmosphere created by the piano’s design and its ambiance, I approached it to study its structure and embellishment more personally. The owner, “Phil Kim,” shadowed me and pointed out that the cover to the piano was divided into three leaves, and he carefully unfolded them back to expose the full keyboard. It was quite an experience! To see a piano that opened up like a table in sections was so foreign to what I had encountered in all my piano finding travels. All I could say was, “very, very interesting,” as I was holding off judgment until I actually stroked the keys and detailed the action. Being squarely in the face of the opened piano, I noted the oval “Aeolian” insignia on the fall board that contained the letters Phil had accurately recited to me on the phone. Thinking back on his original Bee listing of an “antique Counsel” piano, I chuckled to myself about it, but decided not to share this amusement with the seller. Instead, I took out my stringy tape measure to see if the instrument was actually “console” size. To my surprise it measured only 35 inches up from its base making it definitely a “spinet.” It’s more diminutive size led me to believe that the piano might produce a dwarfed tone because the strings and soundboard length were inches less than that of a console though on occasion I had encountered some spinets like the “Acrosonic” (made by Baldwin) and Wurlitzer that had a decent “ping” and considerable projection. But I was not holding my breath about this miniaturized Aeolian that had suddenly come into my life. My next area of curiosity was the serial number. 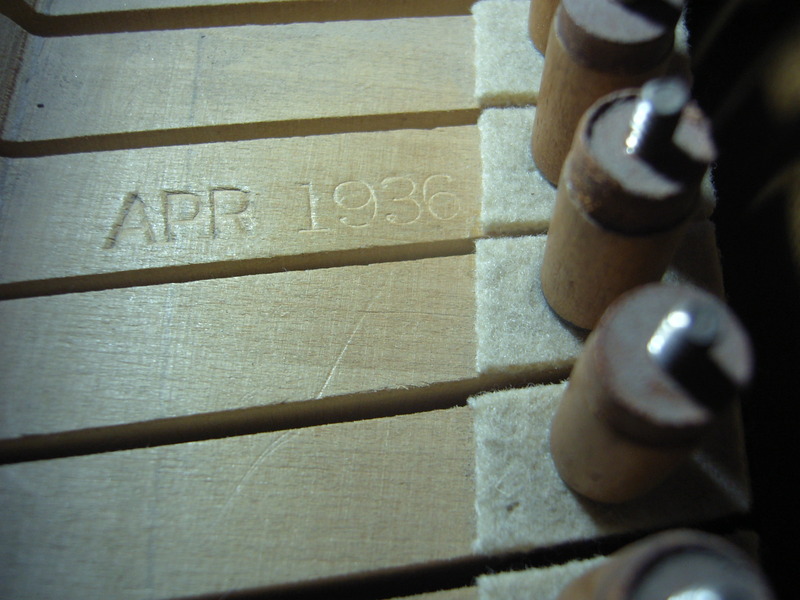 Since I had my Pierce Piano Atlas with me I knew I should able to readily reference the year of manufacture. Finding the numerical information was a piece of cake in this instance—a lot easier than the experience I had with the auctioned Steinway where I had to crawl under the piano with York’s telephoned instructions. “So when did you purchase this exotic looking piano?” I asked him. “Was she the original owner?” I inquired. “Probably not,” he answered. “She lives right nearby in Clovis but I doubt she got it there,” he answered. Just then Phil’s wife entered the alcove by the living room where the Aeolian sat, and introduced herself as “Yolanda.” She was an attractive, Hispanic looking woman who appeared to be about 40 or so. She was petite and attractive, with a doll-like in appearance. Within a short time, I had learned that she married Phil about 10 years before and they had Kara, who was now 6 and prancing around the house, mostly tinkering with an electric keyboard that was conveniently in her room. I could hear the faint bell like sounds emanating from her keyboard in the distance. Phil had a son from a prior marriage who lived with the couple until he departed for college. 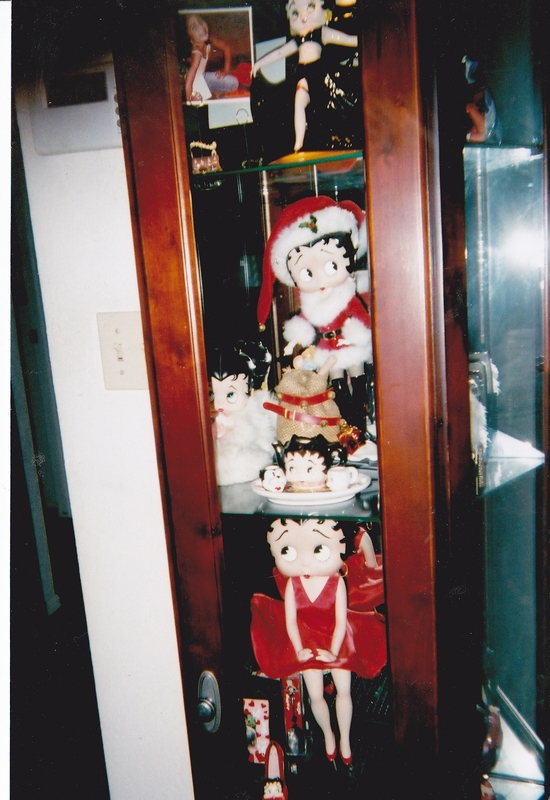 I had noticed that the two of them were thoroughly cleaning up a living room full of ornate furniture that had an interesting window display of “Betty Boop” dolls, an uncanny interest of Yolanda’s. 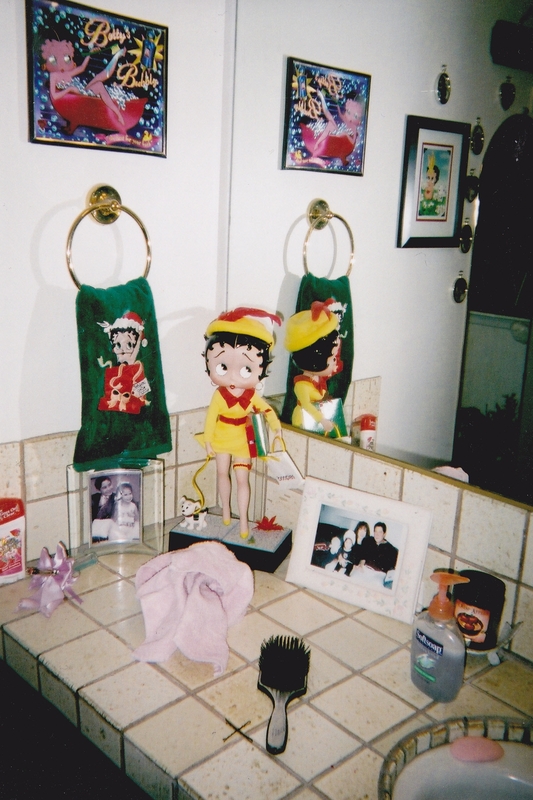 In the course of our conversation she shared her passionate Boop collecting hobby that was manifest all over the house, even in the bathroom where “Betty Boop” memorabilia painted the walls. I took out my camera and got some snapshots with Yolanda shadowing me. “Well, let me sit down and play this lovely looking piano” I said, wondering why I had allowed this crescendo of suspense, to build, when I could have run my fingers over the keys when its leaves were folded back. Was this unbelievable or what? A table piano with three leaves, the perfect title for my next book chapter. From the first I laid my fingers upon it, the little piano sang like a nightingale, but more so than what I had experienced with the Knight piano that was even slightly bigger than a conservative console size piano. It had measured 44 inches, almost 9 inches higher than the Aeolian. Yet this diminutive piano had an enormous reservoir of resonance, and its tone swirled as high as the ceiling and back. It was amazing! And there were no warbling sounds, or false notes in any registers. Everything worked! Knowing all these positives I had to restrain my enthusiasm for it, because I knew immediately that I wanted this piano for myself without a thread of doubt, but for a fair and reasonable price! No one but me was going to own it. I had instantly become an over-possessive lover competing for the loved one. This rose far above the simple acquisition of a musical instrument. I had already become emotionally attached to this small beauty that was a rarity among spinet size pianos. The only down side, was that the instrument had a keyboard full of tarnished key tops. They were definitely not ivories because there were no faintly visible or decisive horizontal lines separating the front from the tail, but they appeared and felt very soft and light. While I loved the feel and consistent action, there were a few ingrained chips that might distract a buyer. But not I, in this case, because the cosmetic irregularities had absolutely no impact on the instrument’s performance, but it could still be a bargaining chip in negotiating down a selling price. Both Yolanda and Phil seemed suddenly taken by the divine tone emanating from their Aeolian as I had played it steadily for nearly an hour, and I had recorded the whole concert for posterity on my Sony portable. Alice and her husband had shared the same sentiment, though they clearly had more of a gutsy attachment to their old upright before I entered their home. It sounded a bit cold and calculating to my ears. Would this woman orphan a child in this way? I was growing accustomed to these scenarios where the owner of a gorgeous sounding instrument might harbor a love/hate relationship with it. “Caroline” certainly registered this with her Knight piano, as did “Jonathon Jones,” attorney, who stored the “piano of his dreams” in a musty, hot garage but kept a less impressive Baldwin in a comfortable, air conditioned living room environment. All this material was grist for a novel or a TV soap script. And I was in the center of the drama, taking an interior look at the private lives of pianos and their colorful owners who were living out a full length soap opera with their pianos. Maybe we needed a new TV addition to the soap roster—“As the Piano Plays,” or “The Last Days of our Pianos,” or “Guiding Light pianos.” I was willing to write a treatment based upon all my lurid experiences in the piano finding universe! It was about the right time to check the hammer assembly and I did so using my little flashlight. Spectacular! All the parts were clean as a whistle and the hammer felts were hardly grooved indicating the piano had a long playing life ahead of it. With all that I intimately knew about this piano, I was not about to let it out of my sight as I had done with the J. Fritz Sohn, the beauty I had spotted at the American Cancer Society thrift store. I would never make the same mistake twice! This was clearly my opportunity to put a deposit down on the heaven sent Aeolian to assure its perpetuity in my home. “Let me make you an offer,” I said decisively to Phil. I factored in the age of the piano, its condition, and the local market place for something like this and I came up with a figure of $1,100 as my “best offer” on his price-listed $1500 ad. “I want to be fair to you and myself,” I insisted. “Anyone looking at the key tops would cringe and walk away from your piano. Most buyers are very visual,” I said. But I admit that it has a great sound, but still I would have to invest a few hundred dollars to completely re-key it, so I think an offer of $1,100 would factor in my assumed expenses to repair it. Phil didn’t argue with me. He thought that I’d made reasonable case for my bid, and he was willing to take my $50 deposit. I told him that I needed 3 to 5 business days to complete the transaction because the following day was Memorial Day so banks would be closed. I would be electronically wiring funds into my checking account from my IRA Profit Sharing fund. If all went well I figured I could deliver him a money order by mid-week. I shuffled out the door feeling consumed with delight. It was like I had just given birth to a baby but the best part lay ahead. I eagerly anticipated bringing the new family member home. Such blessings were few and far between so I savored them as much as I could on this day before the big holiday. My beautiful little spinet with its nightingale voice arrived on a Friday afternoon about two weeks after I first put down my deposit on it. It looked perfectly placed in a room that already housed two Steinways and two Casio keyboards. Still another digital piano from the Casio Corporation in Dover, New Jersey was on its way as a thank you from the company for my unpaid endorsements of the PX110. Executives had caught wind of my record breaking, non-commissioned sales amounting to at least a dozen at the local Guitar Center. With my Aeolian safely contained in its new home sitting opposite my Steinway studio model, I took photos of it, and e-mailed them around to a few registered piano technicians. One, named “George Corneliussen,” who I had found on the Internet had rebuilt a 1917 Aeolian grand and seemed to know his way around the block. “Cy Shuster” another piano tech, who posted on Pianoworld.com said he was going to do some research on the piano and get back to me. “Del Fandrich,” a well known American builder of pianos, e-mailed me after he had read my long-winded correspondence and reviewed my photos. YORK was briskly on the scene, to shine his old, dented lamp on the piano. Since I was understandably very overprotective of my recently acquired treasure, I wouldn’t allow him to take it apart because he was known to man handle more than a few pianos in his time. My Aeolian, like a newborn baby, was getting its first sniff of a new environment, and needed time to adjust. “Hey, let me get my hands in that there piana, so I kin tell ya more about it,” he said. He seemed like a hungry animal searching for a delectable bone! YORK and other technicians figured the serial number dating to 1920 was a Pierce Piano Atlas blunder but Robert Furst, of Bluebookofpianos.com was really the first person to question the dating accuracy. I could hardly process mechanical information like this, and when York tried to capsulize it, I still couldn’t get a handle on it. But I was convinced from the preliminary evidence obtained, that my piano was definitely not produced in 1920. So I was now confronted with still another mystery that rose to the proportion of what pertained to the “player piano without a name.” It seemed like needing to know a piano’s brand identity and date of origin compared to the intensity of an adopted child seeking its birth mother. “The spinet piano,” Furst wrote, “was a culmination of a trend among manufacturers to make pianos smaller and cheaper. It was dainty looking compared to the old bulky upright… and because of its small size, new actions had to be devised.” He also stated that vertichords and vertigrands were offshoots of the spinet, but he didn’t anywhere refer to the “table piano” model that I possessed. From my own additional cyber research I had located “Haddorf” and “Mathushek” pianos that had comparable leaves and the table appearance of those dated to the 1930s. Furst received still another set of Aeolian photos from me a week later that he successfully downloaded. They revealed more graphic details of the piano, inside and out, and on the basis of his having reviewed these, he updated his opinion. “Your piano is definitely not a vertigrand,” he insisted. “It’s just a spinet from about 1960!” In his third e-mail to me on the subject, he wrote, “here is my final answer: 1960!” Now it’s true he hadn’t the benefit of evaluating the piano in person, but he didn’t think this was an impediment to his current appraisal. He understandably refuted the 1920 Pierce dating, but his own modification came as an enormous shock! If his assessment was accurate, then my Aeolian wouldn’t be an “antique,” and it would be relegated to the status of a garden variety spinet. Ironically, I had located an Aeolian match to my piano on Ebay and the seller claimed that the piano, with a serial number a few digits away from mine was at least “80 to 100” years old. We had even talked by phone and compared notes. His particular table style instrument was located in Chatsworth, California, but as it turned out, he didn’t have any conclusive information about the dating. He was hoping that I could enlighten him! I was determined not to let Robert Furst’s opinions impede me from finding out the truth about my piano. Like YORK, I held to the belief that I had a treasure dating many decades before 1960 and would not be sold a bill of goods to the contrary. York hung in there with me, and traipsed over to my place still another time to inspect the piano. He had the determination of a lion as he headed straight for the Aeolian! He stuck his powerful mitts underneath the action without pulling it out. Looking like a gynecologist, he did an internal exam, minus the rubber gloves. It was definitely a sight to behold as this old man, country doc to “pianas” for nearly 60 years, was going to make the defining date diagnostic sooner than later. I just knew it! YORK dove down to the rug, and nestled himself up against the pedal lyre, enlisting my help to disengage the lower wood panel. It was a bummer. There should have been a hinge attached to undo the part, but it just wasn’t there. York said this was further evidence that the piano was not from 1960. “It can’t be,” he insisted. I took photos of YORK in his uncompromised position, tightly squeezed under the Aeolian’s keyboard and once he had successfully dislodged the bottom panel, I took some nifty snaps of the exposed section. Wow! The spruce soundboard was shiny and immaculate! Everything else, including the pedal rods were in ace condition. YORK and I marveled over it, but nonetheless, we still had no hands on proof that the piano dated to the 1930’s. I bent down and cocked my head to get a better look. I searched meticulously for clues hidden in the depths of the piano—in its nooks and crannies, but nothing turned up. It was very frustrating! YORK didn’t need anything more conclusive to make his assertions. He had been around pianos since 1948 and if he said the piano dated to the ’30s, I could probably trust him, but I needed some hard and fast proof to transmit to Furst and others who had gotten into the action. (pun intended). Just a week later, Terry Barrett, Registered Piano Technician dropped over as scheduled to tune my Aeolian, and though he had severe vision problems and couldn’t drive a car, he was still the best damned tuner in Fresno. Barrett regularly maintained my Steinways, but this was the first he had seen of my Aeolian and it inspired his admiration. After I played a few selections for him, he remarked about the piano’s lovely resonance, projection, and appearance. We both heartily agreed that the spinet played well and looked absolutely gorgeous. When I brought up the dating issue, Terry quickly begged off, saying he had no experience with these kinds of pianos. At 45 years of age he certainly hadn’t YORK’s savvy about vintage era pianos, and he plainly admitted it. Terry dismantled the fall board (not done when YORK inspected the piano) and exposed the full length of the key wood. Suddenly, I thought I saw some printed letters in the wood on D-1, the first D on the piano from the lowest end. “Hey, Terry, I see something right here, and I need a flashlight, quick!” I could feel my heart racing because I knew I was onto something! Terry had his own little, high intensity, close up light that he shined on the wood so I could get a closer view. Oh my gosh! We were zeroing in on it! The first letters were “APR” and then I squinted hard to see more. Terry pushed the light down lower so I could view the other characters. As luck would have it, I spotted the numbers “1936” and screamed with delight. TERRY! WE GOT IT!! WE FOUND IT! YIPPEE!!!!! I felt as happy as Alice did when she beamed her flashlight onto her player piano’s cast iron plate and shouted out the serial number. It was like we both landed the prize!!! “Geeze, Terry,” I said, “let’s get some pictures of this!” I raced anxiously to my kitchen counter to find a working instant camera. A few had bitten the dust from lying around and had no flash function but I managed to salvage one that seemed to work. Still, I had no faith that this cheap device would capture the numerics that were not as deeply ingrained as the letters “APR.” Terry saved the day by taking out his pricey digital, and focused it smack up against the key wood. He took three close-up shots as I aimed his high power light right at the source. He showed me exactly what the photos captured right after he took them so I got to see all the detail! I felt a rush of excitement knowing we had permanent, indisputable evidence that this baby was born in 1936! Mazel Tov! I thought to myself! Let the world receive this little princess! “Whoa, I gotta have these pics as soon as possible, Terry! Can you e-mail these to me, later today,” I said with fever pitch anticipation. It was a magnificent day for me and my piano! And without a doubt, a truth finding victory. I could now happily embark upon my journey with the Aeolian and savor every moment of it until death parted us! I enjoyed the living daylights out of that post! From the false accusations, to the old piano tuner, to the car interior that needed to be cleaned, and then to finally get the prized date correct! I like that “country doc to pianas” and your sense of humor is wonderful! Thanks for the smiles!! I read this article with great interest as we recently were given a very similar piano by my parents. I remember going to Milwaukee in the 80’s to get it from my Great Aunt’s home. She purchased it in Milwaukee many years earlier but I had no idea how old it was, I read every letter of this fantastic post. Especially when I got to the end (I didn’t even cheat and look ahead). I looked in the same spot for the date and lo and behold I own the older brother or sister of your piano, MAR 1936 was stamped boldly. Thanks for solving my own mystery and I now know there is a twin existing here in the States! How delightful to receive your comment on this post and glad I was able to help you sleuth your piano’s birth date.